I have noticed in winter when the limbs are bare there is an optical illusion that occurs when one places a tree between oneself and a street lamp. 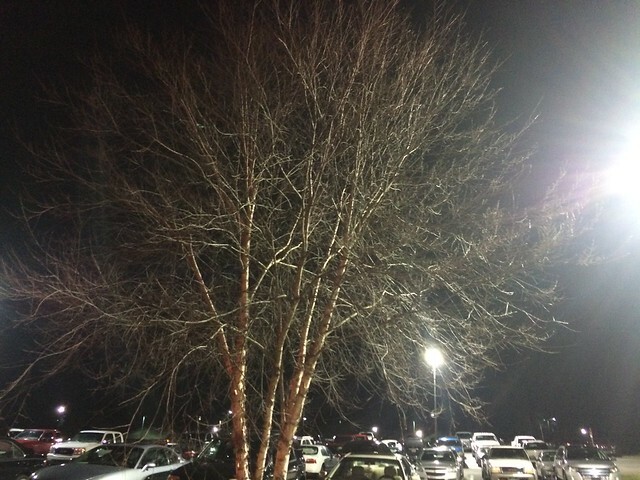 Whenever a bare tree is backlit the limbs seem to be growing in concentric circles around the light. With the light behind the tree. Had to block the light eith my hand so the camera would expose for the branches and not be washed out by the lamp. Anyone understand why this occurs? Looks as if it's to do with a proportion of the light being reflected rather than being absorbed and re-emitted in a random direction. Perhaps the bark is slightly shiny or wet. 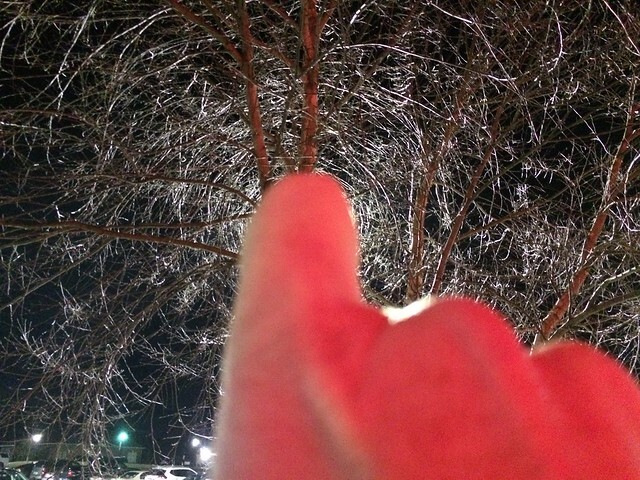 This would account for what you're seeing, because a branch at any other angle would reflect the light away at a different angle and it wouldn't reach your eye/camera. Your eye is a point sink - opposite of a source. If you imagine straight lines connecting your eyes to any branch, you are only seeing the light illuminating the branches from that point of view, and as you are at the centre, it will appear to be circular. The effect is more pronounced with wet and or icy trees. It goes away when the tree starts to bud and leaf. Thank you. This makes perfect sense to me. The human brain is particularly adept at finding geometric shapes, or imposing them on random structures. We are better at finding (or imposing) lines than appreciating smooth gradients of intensity. If you look carefully at any small sector of the image, you can see branches in random directions, but as the reflected light intensity decreases smoothly with increasing radius, the brain interprets this as circles convoluted with spatial noise rather than a sampled radial gradient. This phenomenon caused a lot of problems in the early days of CT scanners. Because the image was built up from circular scans of an essentially random object, radiologists often complained of a "ring artefact" but a computer search of the images revealed no reproducible circular structure (which you would expect if there was a fault in the machine) - the "artefact" was in the mind of the beholder. I'm intrigued by the possibility of rapid training. Occasionally a light aircraft may be trailing a tow rope for launching gliders. I'm pretty sure that the thickness of the rope is below the limit of visual acuity at a mile range, but pilots can "see" it because they expect it. The question is how many times do you have to actually see one close up before you can spot it at a distance? Then if you were raised in a paleoliothic culture and environment, with no pure geometric shapes, would you spot the circular "artefacts" in a backlit tree or a noisy CT scan? Further digression. It's pretty easy to tell which instruments are playing in an orchestra, even though the signal reaching your ears is just a single train of pressure waves. But if you had never heard the individual instruments, would you know that the sound is coming from a violin and a trombone playing together, or would your brain synthesise a single source? How long does it take to learn to separate them? On your digression, the brain uses the initial transient of a sound to determine which instrument and puts greater weight on this compared to the steady state. If you miss the beginning of the note it is very hard to tell difference between many types of instrument.